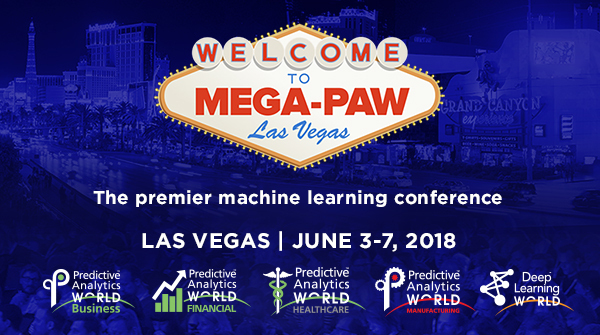 We're excited to announce that John Elder, Founder & Chair, Elder Research is confirmed to deliver a keynote address at the Predictive Analytics World Mega-Event, taking place in Las Vegas on June 3-7, 2018. This will be a joint, super-plenary keynote accessible to attendees of all five (5) Mega-PAW conferences: PAW Business, PAW Financial, PAW Healthcare, PAW Manufacturing, and Deep Learning World. Data science, if judged as a separate science, exceeds its sisters in truth, breadth, and unity. DS finds truth better than any other science; the crisis in replicability of results in the sciences today is largely due to bad data analysis, performed by amateurs. As for breadth, a data scientist can contribute mightily to a new field with only minor cooperation from a domain expert, whereas the reverse is not so easy. And for utility, data science can fit empirical behavior to provide useful model where good theory doesn't yet exist. That is, it can predict "what" is likely even when "why" is beyond reach. John Elder, Ph.D., chairs America's most experienced Data Science consultancy. Founded in 1995, Elder Research has offices in Virginia, Maryland, North Carolina, and Washington D.C. Dr. Elder co-authored 3 award winning books on analytics, was a discoverer of ensemble methods, chairs international conferences, and is a popular keynote speaker. John is occasionally an Adjunct Professor of Systems Engineering at the University of Virginia, and was named by President Bush to serve 5 years on a panel to guide technology for national security. Predictive Analytics World is the place to meet peers, new partners, and get up to speed on the industry's latest developments and opportunities. The networking is like no other. Don't miss the biggest PAW event to date.